Federal law enforcement authorities have authority given to them under various parts of the United States Code (U.S.C.). Federal law enforcement officers enforce various laws, generally at only the federal level. There are exceptions, with some agencies and officials enforcing state and tribal codes. Most are limited by the U.S. Code to investigating matters that are explicitly within the power of the federal government. Some federal investigative powers have become broader in practice, since the passage of the USA PATRIOT Act in October 2001. The Department of Justice was formerly the largest, and is still the most prominent, collection of Federal law enforcement agencies. It has handled most law enforcement duties at the federal level. It includes the United States Marshals Service (USMS), the Federal Bureau of Investigation (FBI), the Drug Enforcement Administration (DEA), the Bureau of Alcohol, Tobacco, Firearms and Explosives (ATF), Federal Bureau of Prisons (BOP), and others. However, upon its creation in 2002; in response to the September 11, 2001 terrorist attacks; the Department of Homeland Security (DHS) became the Department with the most sworn armed Federal law enforcement officers and agents after it incorporated agencies seen as having roles in protecting the country against terrorism. 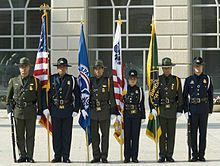 This included large agencies such as Immigration and Customs Enforcement - Homeland Security Investigations (HSI), the U.S. Secret Service (USSS), the U.S. Coast Guard (USCG), the U.S. Transportation Security Administration (TSA), and the U.S. Customs and Border Protection (CBP)—which combined the former agencies of the United States Border Patrol, United States Customs Service, and the United States Department of Agriculture's Animal Plant Health Inspection Service (APHIS) into a single agency within the DHS. Federal law enforcement in the United States is more than two hundred years old. For example, the Postal Inspection Service can trace its origins back to 1772. U.S. Customs and Border Protection officers board a ship. ^ a b "CBP Through the Years - U.S. Customs and Border Protection". ^ Hatcher, Jeanette. "LibGuides: Criminal Justice: Federal Law Enforcement Agencies". ^ "Chronology of U.S. Postal Inspection Service". Retrieved 2013-11-26. ^ bjs.ojp.usdoj.gov Federal Law Enforcement United States Bureau of Justice Statistics Publications & Products. Page last revised on 17 June 2010. Retrieved 2010-06-17. Wikimedia Commons has media related to Federal police of the United States.